A Pakistan-arranged meeting between U.S. and Taliban officials will be held Monday in the United Arab Emirates to push a political settlement to the war in Afghanistan. 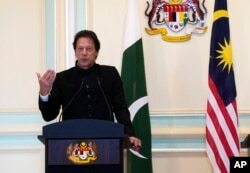 FILE - Pakistan's Prime Minister Imran Khan speaks during a press conference in Putrajaya, Malaysia, Nov. 21, 2018. 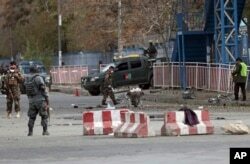 FILE - Security forces inspect the site of a deadly blast in the center of Kabul, Afghanistan, Nov. 12, 2018.